For generations the Hamilton Ranch was widely-known as the Carroll Ranch - and it served as a vital link between the Big Hole and Beaverhead valleys. Its location at the base of this mountain pass made the ranch a perfect stopping point for stagecoaches, cattle drives and virtually every other kind of traveler throughout the frontier era and beyond. For years the ranch housed a team of relief horses for the postal delivery service. Even after motor vehicles became common, bad weather could make the roads impassable, forcing travelers to stop here. Family members recall that during the Great Depression no drifter was turned away hungry. more than 100 years after their great-grandparents emigrated from Ireland. Yet the family name endures - Big Hole Pass is still known locally as Carroll Hill. 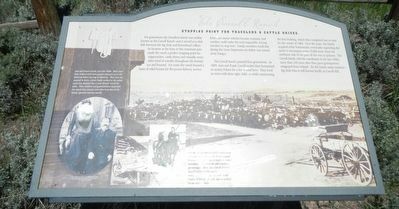 Erected by Montana State University (Bozeman), Bureau of Land Management, Montana Stockgrowers Association. Location. 45° 19.8′ N, 113° 14.688′ W. Marker is near Jackson, Montana, in Beaverhead County. Marker is on State Highway 278 near Bull Creek Road, on the right when traveling south. Touch for map. Marker is in this post office area: Jackson MT 59736, United States of America. Touch for directions. Other nearby markers. At least 7 other markers are within 7 miles of this marker, measured as the crow flies. A Soul-Searching Birthday (here, next to this marker); "Hot Spring Valley" (here, next to this marker); Naturally Sustained Productivity (a few steps from this marker); Undaunted Stewardship (a few steps from this marker); Welcome to Hamilton Ranch (about 300 feet away, measured in a direct line); "I now take my leave..." (approx. 0.4 miles away); The Way It Used To Be... Way Back (approx. 6.8 miles away). More about this marker. 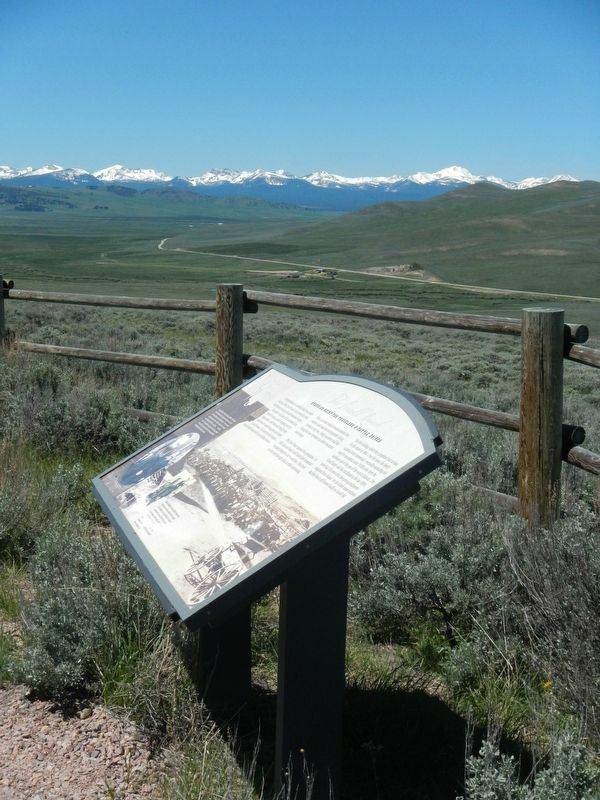 The marker is located at the overlook at the end of a short path, southwest of Idaho State Highway 278. More. Search the internet for "The Carroll Ranch". Credits. This page was last revised on October 4, 2018. This page originally submitted on October 4, 2018, by Barry Swackhamer of San Jose, California. This page has been viewed 47 times since then and 11 times this year. Photos: 1, 2. submitted on October 4, 2018, by Barry Swackhamer of San Jose, California.